My assistant Becky wanted me to do one last shout-out for international signed book orders. The deadline is tonight, if you want them signed before I leave on tour. Anything you order after right now I won't be able to sign until I return from the UK at the end of November, and with the way international holiday shipping goes, books I sign then are unlikely to reach you before December 24th. The release of the new Mistborn book, THE ALLOY OF LAW, is one week and eight hours away. The BYU Bookstore will start handing out line numbers for the midnight release at 7:00 a.m. on Monday November 7th. For more details, see my events calendar. This week's Writing Excuses podcast episode was recorded at Dragon*Con and features Mary, Dan, and Howard talking with Mur Laferty about continuing education for writers, such as workshops, podcasts, and books. My assistant Peter uploaded another chapter of my unfinished 2001 novel MYTHWALKER, and another collection of my Twitter posts. The book should be DRM-free (I know for sure that the iBooks version is), so if it hasn't yet appeared on your preferred ebook store, either the iBooks version or the Nook version should work for you (if you don't want the Kindle version). The Nook version is optimized for devices using the Adobe Digital Editions framework (such as the Sony Reader, etc. ), but I have not personally verified that it is DRM-free. InkWing, which sells shirts based on my books, recently had a contest giving away three of their new Alloy of Law T-shirts. (I mentioned it on Twitter and Facebook.) Anyway, the winners have now been announced, so if you entered, check to see if you won. The shirt itself is offered with free shipping for a limited time. 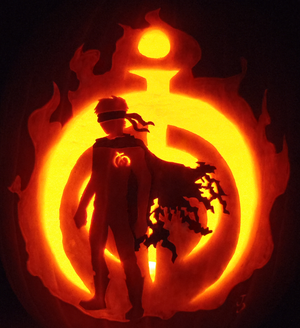 Here's a really cool Mistborn pumpkin by deviantART member joh-wee. She calls it "Survivor of the Flames." Be sure to check out the full image and the unlit version. My assistant Becky wanted me to remind international readers that the deadline for ordering books so I can sign them before leaving on my book tour is one week from today. More details here. There's a new chapter of my abandoned 2001 novel MYTHWALKER up. Things should start to happen again in the next chapter. This week's Writing Excuses podcast features another one of our brainstorming episodes. This time Mary, Howard, Dan, and I mash up four wacky headlines to each come up with a story. The results are pretty entertaining. And there's another collection of my Twitter posts up. If you haven't been following me on Twitter or Facebook, you've been missing each time I announce a reader's name I have inserted into A MEMORY OF LIGHT. For more details, see here. I'm very happy to report that the Mistborn trilogy ebooks are now, at long last, available again in the UK (and Australia and New Zealand) in what should be error-free editions (unlike the old versions that used to be available). This has been longer in coming than any of us would have liked, but it's good to finally be able to announce this. Finally, some Mistborn readers from Austin, TX wrote in to let me know they have recorded a song from Zane and Vin's points of view that is, appropriately, metal. With a lot of screaming. Not about puppies. I'll let you form your own opinion. In the most recent Writing Excuses podcast episode, award-winning editor Lou Anders joins Dan, Mary, and Howard to discuss writing endings. Give it a listen. My assistant posted another chapter of my abandoned novel MYTHWALKER from 2001. MISTBORN: THE ALLOY OF LAW will be released in three weeks, and Sam Weller's has already sold out of their preorder quota of signed and numbered copies. I'll drive up there this Friday to do the signing, and then they'll start shipping the books out with the goal of getting them to your door on November 8th. In some cases it might take a couple of days beyond that, since they need to estimate arrival time and have to be careful not to have the books arrive early (which is a no-no as far as the publisher is concerned). Please bear with them. If you don't care about a numbered copy but just want a signed book, check my events calendar to see whether I'll be signing near you. I'm hitting many areas of the US with one stop in Canada for the first time, plus my first-ever tour of the UK. My calendar also lists some of my worldwide convention appearances for 2012. If you'd like to be sent an email reminder when I am appearing near you, join my mailing list and mention what city you live in. I will even sign Kindles or Nooks if you're into that sort of thing. Regardless, the ebook will be released the same day as the hardcover, which is a frequently-asked question. You can read the first six chapters for free right now. NYCC is this weekend, and I'll be there Saturday only. Here's my schedule. Hope to see you there! But if you live in the area and can't make it to the convention, I'll be back in November for the THE ALLOY OF LAW tour. Check out my events calendar. Long a staple of the SF/F genre, epic fantasy is poised to take a coup over the bestseller lists, thanks in part to HBO's fantastically popular series based upon George R.R. Martin's "Game of Thrones" novel. This summer saw signing lines hundreds of readers deep (luckily none with swords in hand) for #1 New York Times bestselling author Patrick Rothfuss' American appearance. Now, in a special spotlight session exclusive to New York Comic Con, we pair internationally bestselling author Brandon Sanderson, Peter Brett, Phillipa Ballantine and epic fantasy debut authors Rae Carson, David Chandler and Nils Johnson-Shelton talk about why swords and sorcerers, king-makers and kingslayers; dragons and high drama have renewed resonance in fiction. I've made another Twitter archive post. And as I continue writing the first draft of A MEMORY OF LIGHT (now up to 75% of my 300,000-word projection), keep your eye on Twitter and Facebook. Each time I come across a spot in the book where I need to insert a new name, I'll pick one from the A MEMORY OF LIGHT fundraiser drawing that's currently ongoing, and I'll announce whose name I picked. For more info see last week's post. In this week's episode of the Writing Excuses podcast, Dan, Mary, Howard, and I cover pitching. This is something we get a lot of questions about, and it's an important skill for a writer to learn. There's a new MYTHWALKER chapter up, which features a lot of Siri and Vvenna. Now that the mass market paperback of TOWERS OF MIDNIGHT has been released, I've added signed hardcover copies of the book to my online store. I will personalize each copy to your request—you can have me write something like "Music to dazzle" or "Iron to bind" if you like. And of course all of my other books are available as well. Because I'm going on tour in North America and the UK all November long, the sooner you can get your order in, the better. (If getting a book by December 24th is important to you.) In fact, for international orders, we're setting a deadline of November 1st so I can sign everything before I leave. The U.S. deadline is December 5th. Jewelry orders have different deadlines; see below. Now, if your order comes in too late we will still do what we can, but the likelihood your order will arrive before December 24th goes way down. Short version: I'm going to be drawing a bunch of names to adapt for use in A MEMORY OF LIGHT. To add your name to the pool, donate here. There will also be an auction for a more important character name in November. Long version: If you were following me on Twitter and Facebook early last year, you saw me mention a large number of readers whose names I was adapting to appear in TOWERS OF MIDNIGHT. The most common question I got in response was, "How do I get my name on that list?!" My response was that you had to have contributed to a fundraiser that TarValon.net ran back before THE GATHERING STORM came out. But I let people know there would be another chance to get your name into the final book in the series, A MEMORY OF LIGHT. Each Wheel of Time book has around two hundred new character and place names. When I was writing THE GATHERING STORM I tried inventing names the way I usually do, and I found that some of them didn't blend so well. So I decided to move to the method Robert Jordan used: He picked many names by altering ones that appear in our world today. This fits with the way he constructed the world of the Wheel of Time, as that world is both our world's distant future and distant past, and our legends are based on events from that world and that world's legends are based on events from our world. Picking names that way for TOWERS OF MIDNIGHT resulted in ones that blended in better, with the happy bonus that a lot of fans who had contributed to the fundraiser but not won the contest for the three individual name winners at the time were still able to have their name appear in the book as a minor character (or location). Auctioning off naming rights was something I started doing even before I had the opportunity to work on the Wheel of Time. I spoke some about this in my original post on the subject back in 2009. Well, in April this year, we did another auction to appear in the next Stormlight Archive book. That auction benefitted a local Utah not-for-profit corporation for educational, literary, artistic and charitable purposes, with primary interest in science fiction and fantasy. They in turn donated the funds to BYU's volunteer-run science fiction and fantasy symposium, Life, the Universe, and Everything. The symposium was a great help to me back when I was an aspiring writer, and supporting something like that is a cause I can get behind completely. So we're doing something similar this year for names in A MEMORY OF LIGHT. The process is being run by JordanCon, the not-for-profit fantasy literature convention that was founded in honor of Robert Jordan. I've been to three JordanCons now, and it is a great convention. Proceeds from this fundraiser will benefit both JordanCon and the Mayo Clinic. For the details, I'm just going to quote their news release in full. The Robert Jordan estate, Brandon Sanderson and JordanCon, Inc are pleased to announce a joint effort to raise money for two incredible not-for-profit organizations and offer fans the chance to become a named character in the final installment of A Memory of Light . Fans will have two opportunities to participate in this fundraising effort. The first option will be a highest-bidder auction through eBay’s eBay Giving Works. The highest bidder in this auction will be memorialized as a character (physical description, name within guidelines) in the final installment of The Wheel of Time. This auction will run from November 1 to November 10. The second option is through a drawing. Fans who donate $10 will have their names entered into a drawing to included in the final installment of A Memory of Light. The final number of names drawn is determined by Brandon Sanderson as dictated by the needs of the story. Donating is not a guarantee that you will be included. The Mayo Clinic, a non-profit organization and premier medial research center; as well as JordanCon, a literary convention and non-profit organization based in Atlanta, Georgia are both set to benefit from this fundraiser. JordanCon is a fantasy literature convention founded in honor of the late author, Robert Jordan. Jordan was the author of the best selling The Wheel of Time series. JordanCon features four tracks of simultaneous programming, a Dealers Hall, and charity events benefiting the Mayo Clinic. Past guests have included Harriet McDougal, Brandon Sanderson, David Wong, Jana G. Oliver, David B. Coe and Eugie Foster. New to JordanCon this year will be the Art Show featuring art from a variety of fantasy and sci fi artists. Guests this year will include author Mary Robinette Kowal, artist Sam Weber and Toastmaster Melissa Craib Dombrowski. Please note that JordanCon, Inc has applied for tax-exempt status as a 501(c)3 corporation. While we are awaiting the final verdict from the IRS, we are allowed to begin soliciting donations. Our tax-exempt status will be retroactively applied to the day of our filing. For more than 100 years, Mayo Clinic has inspired hope and contributed to health and well-being by providing the best care to every patient through integrated clinical practice, education and research. Today, your generosity is at the heart of sustaining Mayo's mission. Mayo Clinic has more than 3,300 physicians, scientists and researchers from every medical specialty. They work together with 46,000 allied health employees to care for more than half a million patients each year, from every U.S. state and many countries. In 2006, Robert Jordan was diagnosed with cardiac amyloidosis, which is a rare blood disease where abnormal proteins form in the bone marrow and become deposited in the patient's heart. During his illness Robert Jordan received treatment at the Mayo Clinic in Rochester, Minnesota and encouraged his fans to donate in support of the clinic. JordanCon is proud to continue to honor that request each year through various charitable fundraisers at the convention. If I donate, What happens to the money? All funds received will go directly to JordanCon with 10% of the proceeds going to the Mayo Clinic. May I participate in both? Yes, you may participate in both the General Auction and the Drawing. Please note you cannot win more than one character named for you. Please follow these instructions! In the notes section, include your full name, and email address. What are the rules for naming characters? You may use your name or an appropriate name of your choice, but the author reserves the right to approve it or change it to fit the type of character created. A physical description of yourself may be used. How long is the Fundraiser and when will winners be announced? The fundraiser will run from October 1 to December 1, 2011, and winners will be announced at www.jordancon.org. The auction will run from November 1 to November 10. We will announce the winner of the auction and the first name drawn by Brandon Sanderson. All future names drawn will be announced via Brandon’s website. Can I be entered multiple times in the General Drawing by giving several donations? Yes! For every $10 you donate, you name will be entered into the drawing. If you donate $100, your name will be entered 10 times. However, your name can only appear once in the story. I am trying to donate to the General Auction or enter the Drawing, but have difficulties. Who do I contact? You must contact eBay for issues regarding payments. They are our vendor handling all the transactions. If you are having an issue with the drawing, please contact jordancon@jordancon.org. May I pay by check or cash? At this time we are only able to accept credit card, debit, or PayPal as methods of donation. All fans are eligible to win with the exception of members of JordanCon, Incorporated’s board of directors and their immediate families. All donors give consent to have their names published publicly. This is done to ensure fairness and so you may see that your name did go through before we randomly draw the winners for the Drawing. All winners, including the General Auction winner, further agree to allow us to use their names to announce them as the donors selected to be use in A Memory of Light, including use of their names in any publicity associated with The Wheel of Time in this regard. Private information such as contact emails and phone numbers will be given to Brandon Sanderson in case he chooses to use additional names at a later time. All other copies will be destroyed. Please send them to jordancon@jordancon.org with a subject heading indicating your question. We will get back to you as soon as we can! First some updates. There's a new MYTHWALKER chapter up, and this week's Writing Excuses episode features Pyr editorial director Lou Anders talking about the Hollywood Formula. In addition, Ta'veren Tees has a new shirt up for preorder, Tai'shar Manetheren, and they also have a coupon code.